California State Parks has launched a “keep it crumb clean” campaign to remind visitors to Big Basin Redwoods State Park to never feed wildlife and to pick up after themselves (Photo by Cole Allen). 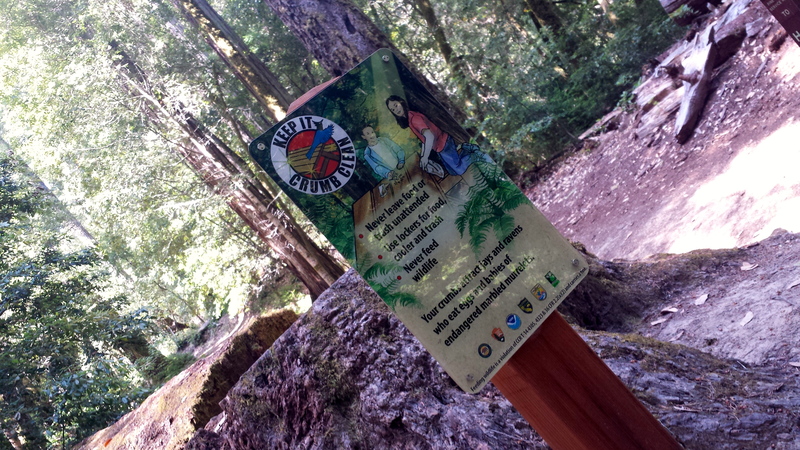 When campers register at the headquarters of Big Basin Redwoods State Park in the Santa Cruz Mountains of California, they receive the usual trail map and, for the past couple years, instructions on how to be “crumb clean” and why this matters to the fate of the endangered marbled murrelet, a seabird about the size of a robin. California State Parks launched its “keep it crumb clean” campaign to educate visitors about the importance of never feeding wildlife and picking up after themselves. The campaign has been propelled forward by a 2014 lawsuit settlement agreement with the nonprofit Center for Biological Diversity, which had claimed the government was failing to protect the bird under its new general plan for Big Basin. The planned expansion of public uses and infrastructure in the bird’s habitat exacerbated the species’ risk for extinction, according to the lawsuit. The marbled murrelet’s low reproductive rate makes it especially vulnerable. A mature female lays only one egg high in the mossy branches of ancient coast redwoods (or other conifer such as firs) that stretch up the Pacific coastline from central California into Oregon, Washington, and as far north as Alaska. The parents take turns incubating the egg and flying miles away to the ocean to eat herring, smelt and anchovies and then returning to feed the nestling. A mere month or so after hatching, a chick will make its first flight to the ocean. That is, if it survives till then. Murrelets face a mighty foe in corvid predators — mainly Stellar’s jays and ravens that are intelligent enough to know food follows humans. When these birds finish foraging around people, they notice murrelet nests high in the trees and attack the eggs and chicks. Jays are a natural part of the forest ecosystem, and murrelets evolved under their predatory pressure. But the corvid’s population has exploded throughout the park, along with the once-rare raven that is now a common sight. 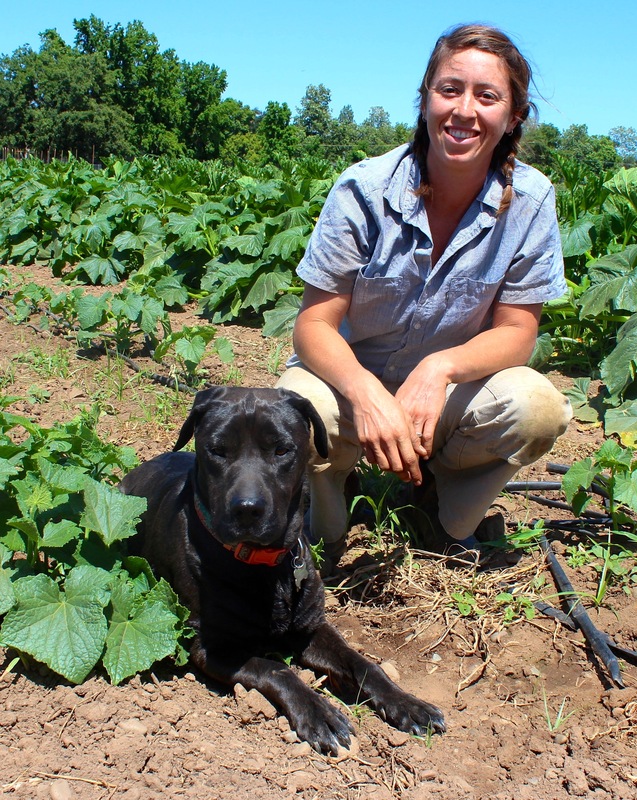 “Whenever there are people, there is food, and whenever there is food, there will be animals taking advantage of that,” says Portia Halbert, the environmental scientist with State Parks who oversees the “crumb clean” campaign in the Santa Cruz Mountains. Some 1.5 million people visit Big Basin State Park each year. An estimated 400 to 600 murrelets exist in the entire Santa Cruz mountain range. 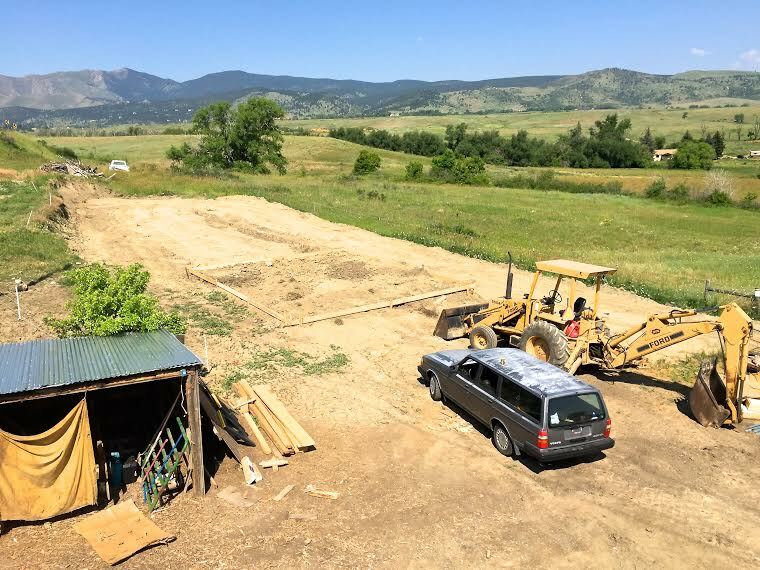 Site of new refinery being built at Black Cat Farm near Boulder (photo courtesy Philip Taylor). 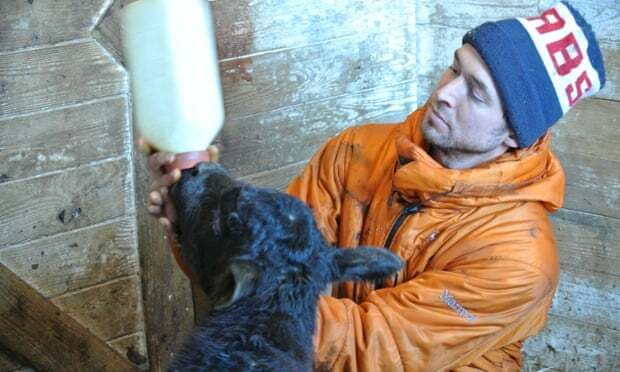 Philip Taylor knew that when the black soldier fly began mating under artificial light in his hatchery at the Institute of Arctic and Alpine Research in Boulder, Colorado, something important was happening. 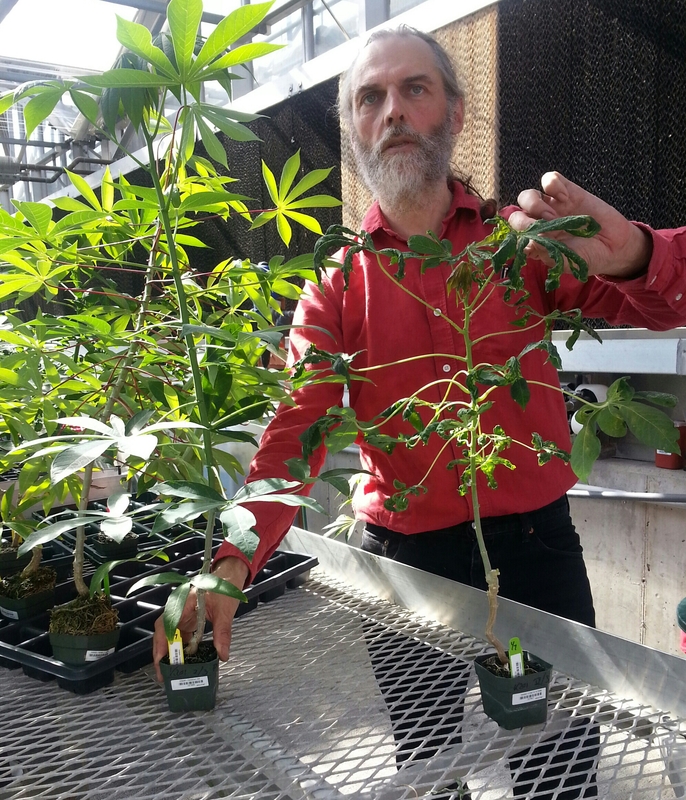 “For the mass production of larvae there needs to be a large and consistent source of eggs,” he explains. Taylor, a fellow with Duke University and INSTARR, needs a lot of larvae for his investigation into how insects can be used as an alternative protein source in animal feed. Using ultraviolet light, humidity and temperature, Taylor is trying to influence mating and egg production among the black solider fly. The goal is to mimic the subtropical and warmer temperate climates where these flies naturally occur, and Taylor is confident he’s found the light bulb that provides just the right balance. He says he’s already achieved about an 80 percent reproduction rate, which is the highest he knows of under artificial conditions. I started this blog to support my two Kickstarter projects — read on! On the 29th day of Nainoa Thompson’s first voyage as a student navigator, he sees two birds fly south overhead. He orders the crew aboard the double-hulled voyaging canoe named Hokule’a to sail in the direction of their flight. These seabirds travel a short distance out to sea at dawn to eat and return to land at night, which means the canoe’s destination, Tahiti, must be nearby. At sunset, a crew member climbs the mast but does not see land. They lower the sails, heave in the Pacific Ocean and wait. By late the next morning, Thompson feels panicked. One of Hokule’a’s crew members saw a bird fly out of the north and Thompson, convinced the canoe passed the island during the night, has the crew reverse direction. But another man — who spied a little fish in the bird’s beak — advises him to turn back. This is nesting season and beforesunrise the feathered animal had flown out to sea to hunt for food to deliver to its babies. Later, the bird would fly out to feed itself. Since that voyage in 1976, the Polynesian Voyaging Society has achieved more than 10 long-distant voyages, and an immeasurable impact on the lives and spirit of Polynesians. Hokule’a touched off a Pacific-wide movement to reawaken a lost art and a Hawaiian Renaissance to restore a lost sense of pride. The years, however, have not been without tough lessons, including the death of a beloved crew member, and the difficulty of repairing the ill effects of Western imperialism and attempting to break down the stereotype of the “Plastic Polynesian.” In 2014, the Polynesian Voyaging Society set sail for an ambitious multiyear worldwide voyage. 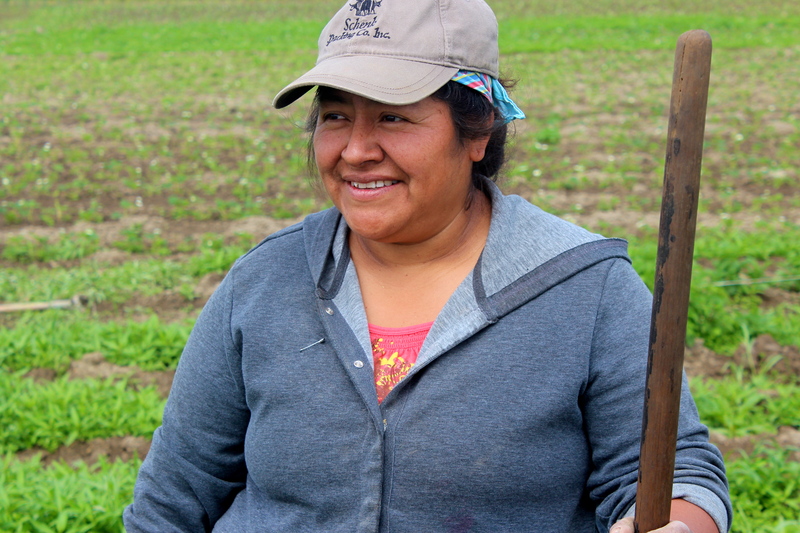 In summer 2012, I spent a week in Quito, Ecuador to research a story called “Quito Grown” for Earth Island Journal about the city’s urban farming initiative and how these farms address rising food prices and a jeopardized food supply. This experience made me even more committed to reporting on issues related to farming and grassroots efforts to put the power of food production back in the hands of people. In 2000, Ecuador adopted the U.S. dollar as its official currency to restore political and economic stability. But the process unintentionally led to rising food prices and hunger among Ecuadorians, particularly indigenous populations, refugees and children. 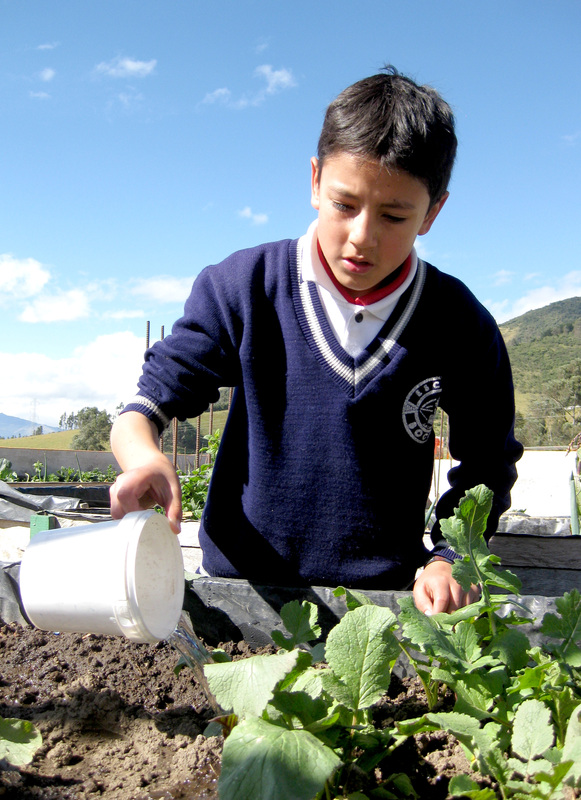 Quito’s urban farming initiative allows families and students to grow produce for themselves, and connects growers to local farmer’s markets at which to sell their healthy fruits and vegetables. Also, because Ecuador ranks as one of the world’s highest users of pesticides, there is a growing demand for organic produce. 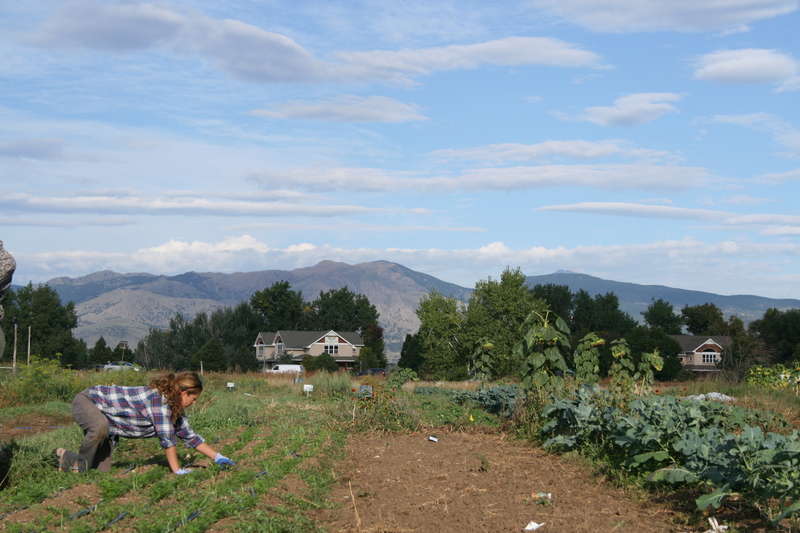 Here we have the seventh and final article in my series on American farming and food systems, as part of my participation in the Ted Scripps Fellowship in Environmental Journalism at the University of Colorado Boulder. I wrote a profile of large-scale California farmer Cannon Michael for Ensia magazine, in collaboration with the Food & Environment Reporting Network (FERN). Read an excerpt below. The profile was brought to life by the beautiful photos of photojournalist and Ted Scripps Fellow Sonya Doctorian. Cannon Michael is a farmer is California’s Central Valley. Photo by Sonya Doctorian.